This Sunday is the halfway point in Lent. 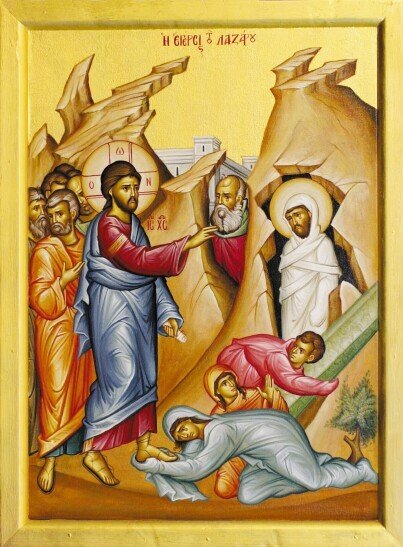 Midway on our journey to Holy Week and Pascha, many of us are tiring of our spiritual disciplines. What we approached with joy the first week has now turned into a chore. We become aware how little love we have in our hearts, which can be very discouraging. For this reason, the Church uses this Sunday to direct our attention to the Cross. The Cross is our strength and our salvation. We look to it and pray to Christ to give us strength to complete this journey. The Gospel passage for this Sunday challenges us again to commit our whole lives to Christ. As Christ was crucified for our salvation, we are called to take up our meager cross and follow Christ by crucifying our sinful desires and surrendering our will to His. What is our cross? How do we deny ourselves? What crosses are we to pick up to follow Christ? How can we gain the whole world and lose our soul? What does this Gospel passage mean for our lives? Decorated Cross—On this Sunday, the priest places a cross standing upright on a tray surrounded by flowers. Do the same in your home so that it can be a source of strength to all as you complete the fast. If you don’t have a large cross, make one out of playdough or cardboard and then decorate it. You can place it in styrofoam to help it stand on a tray. Decorate the tray with flowers from church received on this Sunday or make your own flowers with tissue paper. Place it in a prominent place in your house. As a family, learn to chant the hymn to the Holy Cross. Cross Find—Take a Bible with a concordance and look up the word “cross”. Have each family member find a passage about the cross. If your children are very young, pair them up with an older child or adult. After they find a passage, have them draw a picture to represent it. Lenten Review—Take some time to review your Lenten progress as a family. Look to the remaining weeks and decide if there are other things that you need to do to prepare for the Resurrection of our Lord. Your parish priest can help your family continue on this journey, so do not hesitate to consult with him. Glory to the Father, and the Son, and the Holy Spirit both now and forever. Amen. Shine, Cross of the Lord, shine with the light of your grace upon the hearts of those who honor you. With love inspired by God, we embrace you, O desire of all the world. Through you our tears of sorrow have been wiped away; we have been delivered from the snares of death and have passed over to unending joy. Show us the glory of your beauty and grant to us, your servants, the reward of our abstinence, for we entreat with faith your rich protection and great mercy. God Speaks from the Cross by Anthony Coniaris—This excellent book for teenagers as well as adults offers meditations for Lent and Easter based on the last seven words Jesus spoke from the Cross. Published by Light and Life Publishing. 20th Century Saintly Elders of Greece: Precious Cross Tape #5 and #6—Listen to the amazing story of Fr. Stavros from the island of Crete and the relic of the True Cross of our Lord. The relic was inherited by his mother and completely changed the family’s life. Available from St. Nikodemos the Hagiorite Publication Society. Holy Cross Live!—This video series, featuring professors from Holy Cross Greek Orthodox School of Theology, is designed to introduce basic teachings of Orthodox Christian theology. These programs can be viewed online by going to the Web site of the Greek Orthodox Archdiocese of America (www.goarch.org) and selecting the “Multimedia Programs” link and then the “Video” link.